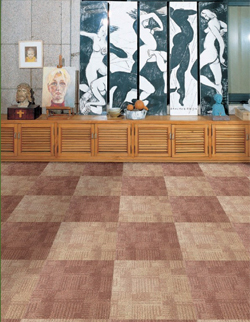 Decoria Luxury Vinyl Tiles are the result of years of experience in manufacturing floor covering. Decoria’s superior construction, accompanied by its tremendous value and exclusive features, makes Decoria one of the world’s leading resilient floors. Geared towards the commercial community, Decoria is gaining a reputation for quality, customer service and tremendous value. With upper-echelon visuals ranging from common flooring, such as Red Oak, to uncommon appearances, such as our Shale Metallic, Decoria is finding a way to appease a broad customer base while maintaining its value-oriented approach. Our catalog of 84 colors is not limited by any means. Although we pride ourselves on stocking all of our patterns domestically, our customers are not necessarily limited to the stock on hand. We welcome special orders while we look to constantly expand our product offering. Relying on our comprehensive network of distribution, Decoria provides customer service at multiple levels. Often times, acquiring Decoria is as simple is dialing the sales representative from your local distributor. We urge you to ask about Decoria, and if you have trouble locating a distributor or dealer near you, we will be happy to provide a method that is best suited for you. When contacting Decoria directly, you will speak to a member of our friendly staff who will be able to assist you and guide you through your questions. Our knowledgeable and helpful staff forms the foundation of the Decoria’s commitment to excellent customer service.